ZoneAlarm®, a product line of Zone Labs, L.L.C. and Check Point Software Technologies, Inc., is one of the most secure brands in consumer Internet security. 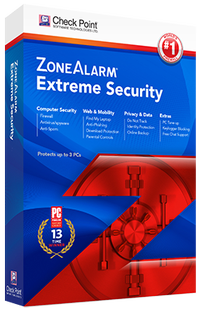 With over 90 million downloads, ZoneAlarm protects PCs from viruses, spyware, hackers and identity theft. The award-winning Internet security product line is installed in consumer PCs and small businesses, protecting them from Internet threats. 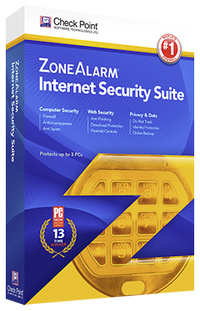 The ZoneAlarm family of products is among the most popular and successful Internet security products available on the market. Check Point Software Technologies, Inc. is a wholly owned subsidiary of Check Point Software Technologies Ltd.
Find My Laptop - need we say more? Antivirus/Anti-Spyware Engine Detects and remove viruses, spyware, Trojan horses, worms, bots and rootkits. Advanced Real-Time Antivirus Enhances protection by checking against an always up-to-date cloud database of antivirus signatures. Advanced Firewall Monitors programs for suspicious behavior spotting and stopping new attacks that bypass traditional anti-virus protection. PC Tune-up Cleans, organizes and streamlines your computer – improving its performance. Online Backup Backs up files and restores your data in the event of hardware malfunction. Identity Protection Helps to prevent identity theft by guarding your personal data. Parental Controls Filters and blocks inappropriate websites and chat rooms and limits time spent online. Threat Emulation Opens email attachments and web downloads in a virtual cloud environment to see if they are safe. Enhanced Browser Protection Protects your computer from web threats before they reach your browser. Find My Laptop Locates your lost or stolen laptop on a map, locks it down and allows remote recovery of important files. Anti-Keylogger Prevents identity thieves from stealing your passwords and keystrokes. Privacy & Security Toolbar Provides Site Check, Do Not Track, Facebook Privacy Scan, private browsing and more. Do Not Track Stops data collecting companies from tracking you online. Facebook Privacy Scan Scans your recent Facebook activity and alerts you to privacy concerns. Control what others can see. Private Browsing Erases your tracks – allowing you to surf the Web in complete privacy. Two-way Firewall Makes your PC invisible to hackers and stops spyware from sending your data out to the Internet.